Destroy the 4 Archer Towers first with the Barbarians and then the Air Defense at the top with your archers. Use 15 Barbarians to take out the 4 Archer Towers. Deploy all Archers at the top to destroy the Air Defense. When the Air Defense is destroyed, deploy the Balloons. 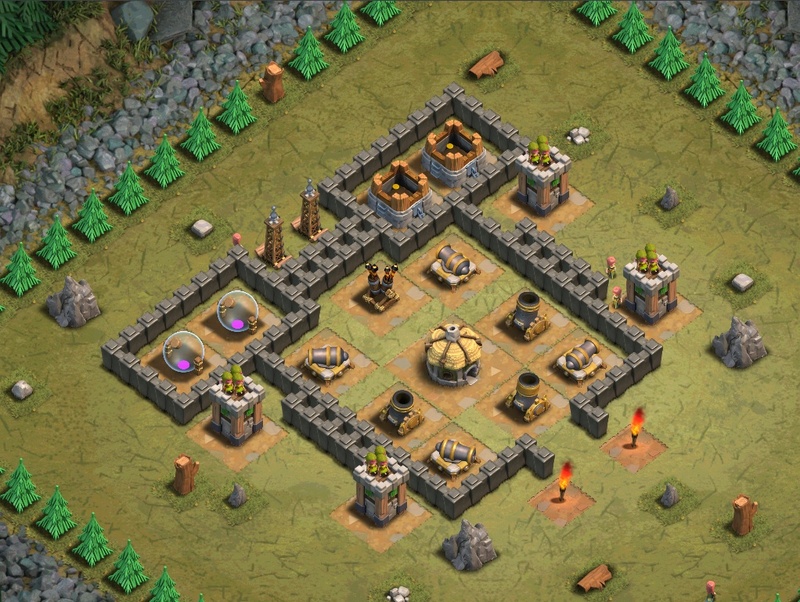 If your Archers aren’t high enough level to take down the two central storages (the Archers will go for them first) then the Air Defense before they’re killed, use two Wall Breakers (per side) to get into the storages near the center and then drop 15-20 Goblins to get them out of the way. This means your Archers will go straight for the Air Defense. The two Hidden Teslas that pop up from between the storages can be dealt with using two Giants to distract defenses and drop a few groups of Archers to clean up the Hidden Teslas. Or strafe 2-3 Lightning Spells to destroy the Air Defense, then deploy 20 level 3~4 Giants at the Teslas with a Healer support. Then follow up with a Wall Breaker to destroy the double wall layer behind the Teslas.